Christmas means… Family. What better excuse is there than Christmas to be around family? ?… or friends that I’ve adopted as family :) At least for me, Christmas is one of the few times I don’t let myself feel guilty at all if we just sit around and do absolutely nothing. Just being together and enjoying each others’ company is what it’s all about! Christmas means… Traditions. And changing traditions. I used to be very strict about our family traditions and got really sad when they changed even a little. As I grow older and the branches of our family continue to go in different directions, I realize things are going to continue changing. We still spend time together, but it’s just different time. And I’m learning that even if our traditions were great before, that doesn’t make our new traditions any less awesome! Christmas means… Christmas lights!!! Everywhere! I love to go see them around the neighborhood and find light displays anywhere I can! My favorite so far is the light display at Disneyworld… A-MAZING! Back in 2010, after an amazing stroke of luck and a lot of strategic planning, I ended up going to Disneyland with friends and a week or so later to Disneyworld with my family. Both light displays were breathtaking, but Disneyworld took the cake :) A close second was the next year when Danny and I went to the Denver Zoo ‘Zoo Lights‘ display! How awesome would those animal lights be in my front yard ^^^!!! haha With how much I love Christmas lights, it still surprises me that I’ve never done outdoor lights. I really want to this year, but we need to get on it if it’s going to happen… we’ll see. If not this year, definitely next! 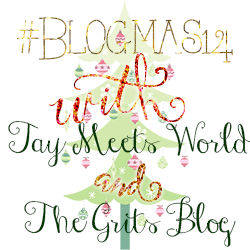 Find more Christmas cheer at the linkup on Tay Meets World and The Grits Blog! Yes, to all of these! I’m a big family and tradition girl (especially now that we have our daughter). I can’t want to start new traditions and continue the old ones with her. There’s just something so dreamy about going to look at Christmas lights. We do it every year. Oh my goodness look at all those lights!! I would be in heaven!! SO beautiful.